William S. Burroughs Sends Anti-Fan Letter to In Cold Blood Author Truman Capote: "You Have Sold Out Your Talent" | Open Culture William S. Burroughs Sends Anti-Fan Letter to In Cold Blood Author Truman Capote: "You Have Sold Out Your Talent"
On July 23, 1970, William S. Burroughs wrote Truman Capote a letter. 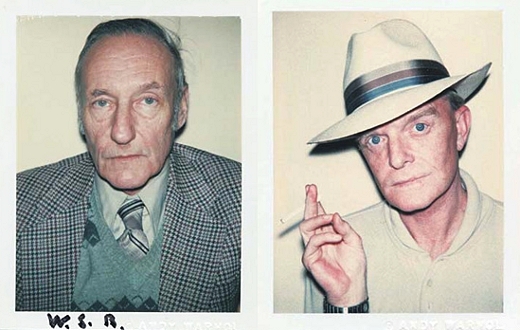 “This is not a fan letter in the usual sense — unless you refer to ceiling fans in Panama.” Instead, Burroughs's missive is a poison pen letter, blistering even by the high standards of New York literary circles. Of course, Capote, author of Breakfast at Tiffany’s and In Cold Blood, was no stranger to feuds. He often traded witty, venomous barbs with the likes of Gore Vidal and Norman Mailer. Yet Burroughs’s letter comes off as much darker and, with the benefit of hindsight, much more unnerving. Seemingly repulsed by Capote's entire project, Burroughs took the Tynan’s critique one step further. He argued that Capote not only sold out his subjects but served as a mouthpiece for those in power. I feel that [Tynan] was much too lenient. Your recent appearance before a senatorial committee on which occasion you spoke in favor of continuing the present police practice of extracting confessions by denying the accused the right of consulting consul prior to making a statement also came to my attention. In effect you were speaking in approval of standard police procedure: obtaining statements through brutality and duress, whereas an intelligent police force would rely on evidence rather than enforced confessions. [...] You have placed your services at the disposal of interests who are turning America into a police state by the simple device of deliberately fostering the conditions that give rise to criminality and then demanding increased police powers and the retention of capital punishment to deal with the situation they have created. You have betrayed and sold out the talent that was granted you by this department. That talent is now officially withdrawn. Enjoy your dirty money. You will never have anything else. You will never write another sentence above the level of In Cold Blood. As a writer you are finished. Over and out. Burroughs' curse seemed to have worked. 1970 was the high-water mark of Capote’s career. He never wrote another novel after In Cold Blood, though he labored for years on a never completed book called Answered Prayers. He spent the rest of his life on a downward alcoholic spiral until his death in 1984. This is not a fan letter in the usual sense — unless you refer to ceiling fans in Panama. Rather call this a letter from “the reader” — vital statistics are not in capital letters — a selection from marginal notes on material submitted as all “writing” is submitted to this department. I have followed your literary development from its inception, conducting on behalf of the department I represent a series of inquiries as exhaustive as your own recent investigations in the sun flower state. I have interviewed all your characters beginning with Miriam — in her case withholding sugar over a period of several days proved sufficient inducement to render her quite communicative — I prefer to have all the facts at my disposal before taking action. Needless to say, I have read the recent exchange of genialities between Mr. Kenneth Tynan and yourself. I feel that he was much too lenient. Your recent appearance before a senatorial committee on which occasion you spoke in favor of continuing the present police practice of extracting confessions by denying the accused the right of consulting consul prior to making a statement also came to my attention. In effect you were speaking in approval of standard police procedure: obtaining statements through brutality and duress, whereas an intelligent police force would rely on evidence rather than enforced confessions. You further cheapened yourself by reiterating the banal argument that echoes through letters to the editor whenever the issue of capital punishment is raised: “Why all this sympathy for the murderer and none for his innocent victims?” I have in line of duty read all your published work. The early work was in some respects promising — I refer particularly to the short stories. You were granted an area for psychic development. It seemed for a while as if you would make good use of this grant. You choose instead to sell out a talent that is not yours to sell. You have written a dull unreadable book which could have been written by any staff writer on the New Yorker — (an undercover reactionary periodical dedicated to the interests of vested American wealth). You have placed your services at the disposal of interests who are turning America into a police state by the simple device of deliberately fostering the conditions that give rise to criminality and then demanding increased police powers and the retention of capital punishment to deal with the situation they have created. You have betrayed and sold out the talent that was granted you by this department. That talent is now officially withdrawn. Enjoy your dirty money. You will never have anything else. You will never write another sentence above the level of In Cold Blood. As a writer you are finished. Over and out. Are you tracking me? Know who I am? You know me, Truman. You have known me for a long time. This is my last visit. The polaroids above were taken by Andy Warhol. No worse threat for a writer. William’s drug addled brain is on full display in the ignorant , self absorbed comments aimed at a writer who was a god compared to the drivel mr. Burroughs’s farted out during his ” career . Jealous much ? What a tool…Burroughs was 100%, dead on, as usual…in denial much, Russ, or is that Joan?? I’m very curious as to the events that may have created a backstory here. I mean, I know all the writers mentioned, and quite a few others, were extremely vitriolic toward one another for decades, but I just sense there might be some particulars that led to Burroughs’ outburst. Certainly if Gore Vidal were still alive, he’d be able to name the pretty boy,or stolen accolade or something that might have prompted this. That Panama fan line is strange, isn’t it? I re-read In Cold Blood a few years ago. To me, Capote’s tragedy is that after all those years staggering onto talk shows stoned out of his mind telling us it might be the greatest book ever written in America, he wasn’t far wrong. Alright, now. Labeling your favored writer as a “god” and ignoring the positive aspect of another’s work is indicative of your heavy bias. It’s almost as if you’re incapable of thinking for yourself, ignoring any dissent against things you prefer or agree with. Any reasonable person would read this article and notice how “ignorant” and “self-absorbed” Capote’s statements were, as well. I find it ironic for you to say “jealous much?” here, as your heaving, over-sentimental praise is obviously directed from a region of obsessive affection and fanboyism.